The Open Range western gun belt and holster rig is based on a gun rig in the movie "Open Range". Available plain only (as shown), straight left or straight right draw. Fully lined with choice of Black, Brown or Natural. Fits most singe and double action revolvers. **Gun and Bullets are not included. Kevin Costner wore a holster similar to this in the 2003 western film “Open Range” and is based on the novel “The Open Range Men” by Lauran Paine. The film featured Kevin Costner, Robert Duvall, Annette Bening and Michael Gambon among others; Costner also was the director and co-producer. Filmed old style the movie moves along slowly concentrating on details, filling out the characters and plot as it goes as seen in the classic old western films until it reaches a grand climatic ending. Excellent acting, plot and the film set in Alberta, Canada gives one the feeling of what it must have been like in the early 1800’s on the open range of the American west. More about open range below. Our fully lined gunbelts are made of 9-10 oz leather with smooth leather lining. The holster is made of 2 pieces 5-6 oz leather nap sides laminated together, smooth in/smooth out which creates a stronger holster that holds its shape better. High quality nylon thread is used for durability in the stitching of all our leather products. Cochise Leather Company is proud of the quality, durability and value that it gives in all of it's products which are hand cut and made by David LaFlair in his Cochise, AZ leather shop. We're located just 25 miles east of the infamous old west town of Tombstone, Arizona. approximately 2 inches below your pants belt. PLEASE DO NOT ESTIMATE YOUR HIP SIZE!!!!!! 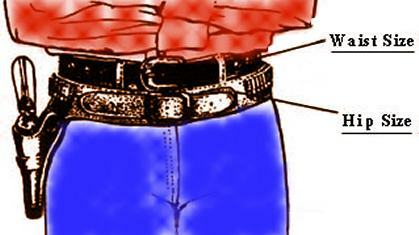 We have to have the correct measurement as shown in the diagram for your belt to fit. Open range in the history of the United States refers to the states north of Texas where between the years 1865 to 1890 between three and five million (estimates of this amount vary greatly, this is the conservative amount) were driven northward and grazed on the thick grasses of the open plains that the buffalo used to graze upon as they were slowly herded northwards to market and the railheads in places like Abilene, Kansas. The Chisholm Trail is one of the many routes that was used, going from Ft. Worth, Texas to the railhead in Abilene via the Oklahoma Indian Territory. This trail was closed when six states enacted laws against trailing cattle northward and the route was then changed to skirt the farming settlements and states. The normal cattle drive had between 1,500 to 2,500 head of cattle with 10 to 20 cowhands to manage the herd. The “Trailboss” was in charge and was sometimes the owner of the herd or the foreman of the ranch. There was also a “Horse Wrangler” who took care of the large remuda that contained between five to ten horses per cowboy for the trip. And last but not least was the ever important chuck wagon cook. Quite often know as “Cookie” he was also next in command after the trailboss. His job entailed not only cooking but often he was doctor, dentist and barber to mention just a few. Food on the trail consisted of easy to preserve items like beans, flour, cornmeal, lard, salted meats and coffee. Sourdough bread was a staple of the cook wagon as it could be continually kept going and ready to bake in a dutch oven at the next stop. When passing near a town “Cookie” would go in and re-provision and perhaps purchase an occasional treat of tinned peaches or fresh apples. The first western chuck wagons appeared around 1866 when Charles Goodnight, a Texas rancher modified a Studebaker wagon (army-surplus wagon) to meet the needs of the cattle drives. A “chuck box” was put mounted onto the back of the wagon complete with drawers and shelves for storage and a hinged lid that kept everything in place when the wagon was on the move and provided a flat working/cooking surface when in camp. A water barrel was attached to the side of the wagon, canvas hung underneath to carry firewood and the rest of the wagon was used to store extra cooking supplies and the cowboy’s bedrolls. Ten to twelve miles were considered a good day’s drive, giving the cattle plenty of time to graze and possibly even fatten up along the way. The average cowboy pay was between just over $1.00 per day, the average cattle drive would last between two and three months and the cowboys received their pay at the end of the drive. Open range ended in most of these places as settlers moved west and started fencing off the property that they were homesteading. There are a few states that still have areas of open range today, Arizona is one of them.